Good facilitation is an essential component to achieving success as a group. A facilitator helps a group of people accomplish their objectives by ensuring comfort, fairness and good participation from everyone, maximizing their ability to come up with ideas and solutions, and keeping them on track to move towards the group’s goals. Facilitation is “an art” that takes a lot of practice. Those who call themselves facilitators usually have a lot of training and/or experience in planning and facilitating group/community processes, meetings or events. Still, learning to facilitate is an ongoing process and no matter how long someone has been doing it, there is always something new to be learned. 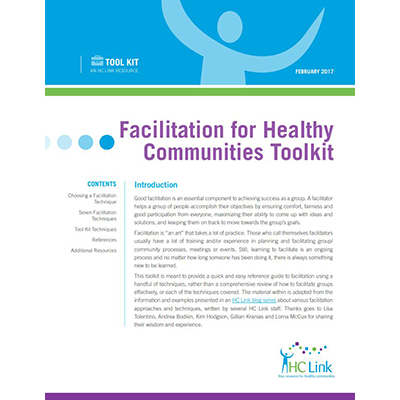 This toolkit is meant to provide a quick and easy reference guide to facilitation using a handful of techniques, rather than a comprehensive review of how to facilitate groups effectively, or each of the techniques covered.